What Makes a Great Woodworker? 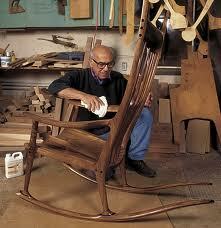 Sam Maloof and his signature rocker. Most woodworkers fall into the “OK” or “good” category; but what makes a great woodworker? What is a “great” woodworker, anyway? I’d like to try to answer that, and further, what makes a great woodworker great? In my mind, a great woodworker stands out; his work is distinguishable from others, because it is technically perfect, useful and creative. It’s technically perfect, in that joints are done right, a correct wood is used, as are adhesives and fasteners. The finish is flawless. In general, there are no flaws to be found – or if there are, you really had to look for them – e.g,, wood putty. It’s useful, in that it suits it’s purpose extremely well. When we say that an object is “good” we mean to say that it carries out it’s purpose extremely well, if not perfectly. A chair, for example – it’s comfortable, sturdy, and attractive; it’s a good chair. Artful woodwork, such as carvings, can also be termed “good” – a good piece of art evokes an emotion; that maybe a wow factor, a feeling of beauty, and so on. Good art does that. Creative – without creativty, woodworkers just become Xerox copiers, in effect. Yes, that’s a great copy of an 18th century grandfather clock – but, it’s still just a copy. It’s like these “tribute” musical acts – guys that sound just like Frank Sinatra, the Beatles or Elvis – ok, they do sound and look like the original – but they will never be as good as the original, nor as popular. Likewise, great woodworkers are creative; they take a fresh approach on an old theme – Maloof did it with a rocker, Krenov with a cabinet, Eames with a chair. All these great woodworkers took the common and made it…better. So now we have some qualities of what may be considered a “great” woodworker; but what makes them that way? I think the greatest attributes are creativity and passion. Passion means you are very interested in the subject, you have a love for it. It may be on your mind often, almost like a love interest. You might consider it your life’s work, your drive, your reason for living even. Creativity is the quality of being able to formulate something new with existing materials; that may be taking a set of oils and making a classic painting; it may be taking food ingredients and creating a delicious dish, or it maybe taking wood and making something useful and beautiful. You have the ability to visualize something new and interesting in your mind. However, you also need to be able to carry out the ideas that come from passion and creativity. You need technical skill. I may be able to think of a wonderful guitar song in my mind, but I can’t play guitar, and me trying to make it happen on a guitar would be horrendous – I have no technical skill for the guitar. Likewise, a great woodworker has a great deal of technical skill at his/her disposal; they can make happen in the real world what they have seen in their mind’s eye – and do that exceedingly well. This includes everything from selecting beautiful and appropriate wood to that last brush swipe on the finish. Another “skill” or at least need that a great woodworker must have (or has someone that can do it for them) is a marketing campaign of sorts – awareness. What good would it be to have a Maloof rocker in a storage closet, or a Mona Lisa behind another painting? Mustn’t others be aware of it to be great? I’m not sure the answer is yes here, honestly. I can build a great desk, beautiful and functional, perhaps even on par with a Maloof rocker or Krenov cabinet – yet if no one else saw it, would it still be great? Well, yes it would, because how great a desk it is isn’t dependent on other’s awareness of it. However, if I want to be considered a great woodworker, others would need to be aware of my work. “Great” people of any kind need to be in the mind of the public to be known as such. So there you have my idea of what a great woodworker is; what say you?